The Genacross Lutheran Services–Toledo Campus, formerly known as Lutheran Home at Toledo, offers a beautiful and welcoming place for seniors of all faiths to call home. Throughout its more than 100-year history, the Toledo Campus has expanded its services, renovated and built new buildings, employed thousands of dedicated workers, and seen numerous changes in health care and society. The Toledo Campus was named a bronze Employer of Choice by LeadingAge Ohio for 2017-2018. As part of the organization’s earliest services, the Toledo Campus was originally known as the “Altenheim” or “Lutheran Old Folks’ Home.” The initial building was constructed in 1906 on land between the Lutheran Orphans’ Home and First St. John Lutheran Church on Seaman Street. Today, the Toledo Campus welcomes individuals with its sweeping lawn at the corner of Seaman and Wheeling streets and remains a premier provider of care services for older adults. The Toledo Campus is designed to empower residents to age gracefully, with dignity, and with peace of mind in knowing that, should their needs change, they will have priority admission to higher levels of care. Genacross Lutheran Services also offers affordable independent senior living communities adjacent to the campus at Luther Grove, Luther Hills, and Luther Ridge. Together with these communities, we offer a complete continuum of care for senior adults. Offering spiritual care to those living in our communities and to their families is an essential part of what we do every day at Genacross. Available 24 hours a day, our chaplains are specially trained to provide for the emotional and spiritual needs of older adults and their loved ones. The Genacross Lutheran Services–Toledo Campus is located at the corner of Seaman and Wheeling streets, near the border of East Toledo and Oregon, and down the road from both Mercy St. Charles and ProMedica Bay Park hospitals. Assisted living at the Toledo Campus provides just the right amount of assistance surrounded by warmth, caring, and compassion. Apartments are complemented by the heritage and charm of the building. The veranda that graces the front of the building overlooks a sprawling front lawn, and the beautiful chapel — with its magnificent stained glass and hand-rubbed wooden interior — serves people of all faiths.The goal of our professional staff is to help each resident maintain his or her highest possible level of independence and dignity in a comfortable, home-like atmosphere. Common areas are tastefully appointed and residents are encouraged to decorate their apartments with the personal touches and furnishings that make it their own. To hear more from our residents and patients, browse through some of our favorite Toledo Campus testimonials here to see why serving seniors is our mission. Assisted living is most appropriate for those who are not able to live alone, but who also do not require constant care. Assisted living on the Toledo Campus offers varying levels of care — from moderate to more comprehensive assistance — with each resident receiving the support of professional staff to ensure he or she remains as active and independent as possible. We are committed to person-centered care and creating an atmosphere in which residents have choice and flexibility in their daily routines, as well as dignity, privacy, and companionship that creates an overall sense of well-being. Upon admission, an individual service plan is developed to understand each resident’s unique needs. Service plans are updated regularly to ensure appropriate assistance is provided as needs change. The Toledo Campus features 40 affordable, private apartments in a choice of two single-level, one-bedroom floor plans. For more information on rates and services, please contact Admissions at 419.724.1852. Compassionate, professional, person-centered care is the hallmark of Genacross Lutheran Services. At the Toledo Campus, our dedicated staff provides a wide range of medical care services. Whether the need is for short-term, post-acute nursing care and rehabilitation or for long-term care, our team of professionals places you and your needs at the center of everything we do. Skilled nursing care — Caring, professional nursing care is provided 24 hours a day, seven days a week by a staff of registered nurses, licensed practical nurses, and nurse aides, with an excellent staff-to-resident ratio for optimal care. Whether it’s long-term care or a recuperative stay, our caring staff is dedicated to making our campus feel like home for residents and patients. Short-stay transitional care — For individuals who require short-term placement following a hospital stay, our experienced nursing care staff collaborates with our Therapy Department to provide the care needed to help patients heal and return home. Our clinical team coordinates with patients’ medical doctors to develop a specialized plan of care to meet all of the patients’ health care needs. Short-term patients generally receive care in the Labuhn Center, located adjacent to the Health Center. We provide on-site case management services and home assessments prior to discharge to home. Memory support —When memories of bygone days eclipse the immediate past, home becomes more than a place. For those affected by dementia and memory loss, home needs to evoke a feeling of warmth, security, and unconditional acceptance. The Toledo Campus provides care for individuals with moderate to severe memory loss. We provide therapeutic environments, creative activities, and well-trained staff members who help residents feel secure and valued. The Toledo Campus accepts most major insurance plans, as well as Medicaid and Medicare. For more information on rates and services, please contact Admissions at 419.724.1841. Rehabilitation at the Genacross Lutheran Services-Toledo Campus is an important part of our commitment to wellness and is especially designed for patients recovering from an illness, injury, or surgery that has resulted in a loss of strength or function. 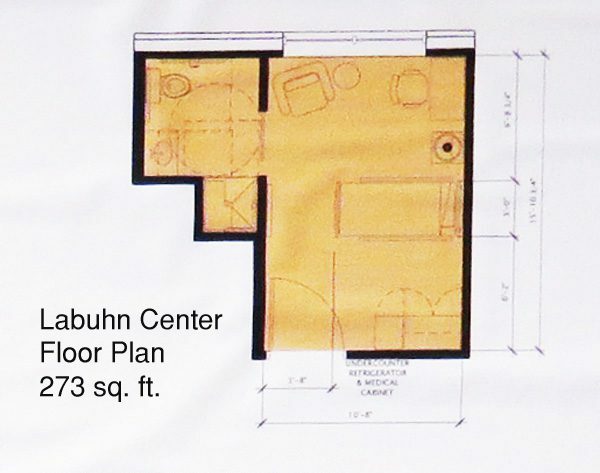 Rehabilitation services are provided in The Labuhn Center, which features 27 private suites and provides a warm, inviting atmosphere for person-centered care in a building separate and distinct from the more traditional long-term care building on the campus. Our rehabilitation goal is your goal: to help you get better and back to your active lifestyle, doing the things you love. Therapy is a key component in helping you maintain your highest level of independence. We take a multi-faceted approach that helps you become stronger, improve your muscle tone, and increase coordination. We also focus on the goals of self-management and prevention. We provide both inpatient and outpatient therapy services in our therapy gyms. Our multidisciplinary team of physical, occupational, and speech therapists will evaluate your needs and plan an individualized program designed to restore function, reduce pain, prevent further injury, and improve your quality of life. Therapists at The Labuhn Center are certified to provideLee Silverman Voice Treatment® (LSVT) therapy for the treatment of Parkinson’s disease and other neurological conditions. The two forms of LSVT amplify movement or speech to achieve results. LSVT BIG® targets large motor skills to improve a patient’s ability to walk, move limbs, and balance. LSVT LOUD® targets increased vocal loudness and can dramatically improve speech. For more information about the LSVT program, call 419.724.2638. Insurance: The rehabilitation services available at The Labuhn Center are typically covered by most major insurance plans. A referral from the patient’s physician is required in order to receive inpatient or outpatient services. Hours: The therapy clinic is open six days a week, Monday through Saturday. We accept admissions 24 hours a day, seven days a week. For more information on rates and services, please contact Admissions at 419.724.1841.